Efficient service 24 hours a day, 7 days a week. Services of a team with experience across all sectors of the healthcare industry. Comprehensive screening service of candidates ensuring quality candidates and peace of mind for you. You can access over 500 nurses and care assistants so that you recieve immediate service wherever you're based and whatever your needs. Holidays or extended periods of absence such as maternity leave don't have to cause you hassle. 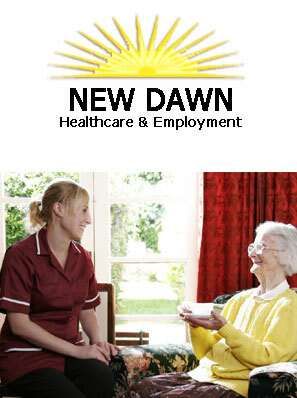 With access to over 500 nurses and care assistants, New Dawn Healthcare can help you plan your staffing requirements ahead of time. You can maintain the continuity of care you provide to your patients every day of the year. When you book staff with New Dawn Health care, you are hiring a ready-made team of healthcare professionals who are happy to meet your staffing challenges head-on. Our healthcare administrator oversees operations and maintains direct lines of communication with your hospital / home. Just like your own employees, we hold our nurses accountable for their attendance and work performance. Excessive call-offs, tardiness or or poor work performance is never tolerated. This ensures that the nurse you book will be clinically proficient, reliable and exceptionally professional. We guarantee it. If there are any patterns of healthcare staffing need, whether they are dictated by seasonal, geographical or specialist demand, New Dawn Healthcare can help you identify and trace these. Working with you to predict and coordinate your staffing requirements effciently, New Dawn Healthcare can offer a cost-effective service to manage specific shprtages. Identifying recurring demand is one thing but New Dawn Healthcare also has the flexibility to tap into a network of over 500 nurses and care assistants to help you provide a long-term solution to your specific shortages. When carers themselves need a break, no matter how long, New Dawn Healthcae can offer respite care. This allows the person recieving the care to maintain their routine with an experienced dependable professional from New Dawn Healthcare. "We want to ensure you are satisfied with our service." Regularly review our policies and procedures, asking our clients to complete a survey every year, rating our service. We keep records which meet high standard and complete supervision meetings with care-workers on a regular basis. We ask all care-workers to complete a questionnaire on their placement, to ensure your needs and wishes are catered for. We comply with all CQC monitoring activities. this normally includes help with washing, toileting, dressing, oral care, feeding, assistance with medication and getting up/going to bed. In addition to their stated care duties our staff can undertake light housework such as making beds and meal preparation. we can arrange for one of our staff to come and sit with our clients to provide support and companionship from one hour upwards. Our nursing and care staff will help you maintain as much independence as possible. for those times when your regular carers are on holiday or are unable to provide your care, we can supply staff to offer respite care. for that little extra help when travelling within the UK or abroad, our nursing and care staff are on hand to help. when round-the-clock care is required, live-in care offers a very cost-effective route to providing short or long term cover, using care staff.